John Ruskin (1819-1900) was an accomplished artist and draughtsman and this Exhibition includes some charming watercolours, and flower and architectural paintings and drawings, by him. However, he is famous not so much as an artist as for his enormous influence on the artistic world and on social thinking in the Victorian age. He was a polymath with interests ranging from geology and botany to adult education and social justice. He lectured and wrote prolifically. The most famous of his books are probably Modern Painters, The Stones of Venice and Unto the Last. The five volumes of Modern Painters includes an impassioned defence of Turner (‘Turner perceives at a glance the whole sum of visual truth open to human intelligence’) and also argued for symbolism and the importance of truth to nature in art, influencing the Pre-Raphaelites. The Stones of Venice, about the history and architecture of the city, included passages about the role of the thinker and the worker in society, showing that social issues were already a concern. The book was an inspiration to Proust, who translated several of Ruskin’s books, and one imagines contributed to Venice’s development as a tourist destination. His social thinking was expounded in Unto the Last which was critical of industrial society and capitalism and discussed the issue of a living wage. It had an enormous impact on Mahatma Gandhi, in particular. Ruskin was an only child. His father was a wealthy wine and sherry importer. The family was very close – perhaps rather oppressively so. They did, however, travel extensively both in Britain and on the Continent. Privately educated, he went to Oxford where he won the Newdigate Prize for poetry and was awarded an honorary double fourth class degree (surely a one-off?). On his father’s death, he was left a considerable fortune, which gave him independence and the means to engage in philanthropy. For example, he established in 1878 the Guild of St George, a charity for arts, crafts and the rural economy. His idea was to make Britain a better place to live. 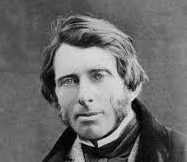 The charity still owns rural land, a relic of Ruskin’s idea of founding simple farming communities, which never came to much. The charity set up a museum in Sheffield to educate and stimulate ironworkers. The Exhibition includes a number of items from its collection (now held by Museums Sheffield). Around the time he set up the Guild, he was also writing a monthly letter addressed to the workmen and labourers of Great Britain on a wide variety of topics. Another group to benefit from Ruskin’s financial and critical support were the Pre-Raphaelites. The Exhibition does not cover this in any detail but presumably not because his wife ran off with Millais. Her departure does not seem to have bothered him (the marriage was not consummated) and he continued to assist Holman Hunt, Rossetti and Burne-Jones. ‘The architecture of Palladio is wholly virtueless and despicable’. On the Houses of Parliament; ‘The most effeminate and effectless heap of stones ever raised by man’. On ‘The Hunchback of Notre Dame; ‘I believe it to be simply the most disgusting book written by man’. The Exhibition gives a clear picture of Ruskin’s life and achievements but perhaps does not get to the bottom of him. However, given the range of his activities and interests, that would be difficult. One has to admire his energy and originality of thought, even if he was somewhat mixed-up. It is quite something to have influenced the Pre-Raphaelites and Gandhi, been the first Slade Professor of Fine Art at Oxford and responsible for cataloguing the enormous collection of artworks left by Turner to the Nation and to have been a forerunner of the Greens.